My dentist said my 6-year-old needs a root canal treatment because of decay, but it’s only a baby tooth; why shouldn’t we just pull it? This is a an excellent question — because, at first glance, if a baby tooth is going to be lost anyway, then why go to the trouble of performing any treatment on it? As you’ll see, there are very good reasons to save it. Baby teeth, also known as deciduous teeth (shedding at a specific stage, like leaves of deciduous trees) have very useful functions and should not be “plucked” before their time. To understand why baby teeth are so important, let’s examine the crucial role they play as units of the whole dentition (the full complement of teeth), and how they function in the development of the growing facial skeleton and mouth. From infancy until past adolescence, the teeth and jaws, like the rest of the body, undergo a process of rapid change and development. Starting from the time the first teeth appear (usually at 6 to 9 months) and continuing until they are lost (around age 10 to 13 years) these “baby” or “primary” teeth have some vital jobs to do. To begin with, they perform all the same tasks as adult teeth, namely: grasping food, grinding it into pieces that can be swallowed, and providing proper contact points for the tongue in order to articulate certain sounds when speaking. They also have other important social purposes: smiling and allowing one to look normal. When lost, these functions can be compromised — and even at age 6, the detrimental effects of missing teeth can be felt for years to come. If a baby tooth cannot be saved and is lost prematurely, it’s usually possible for children to be fitted for an orthodontic appliance called a “space maintainer” to keep the permanent tooth’s place open. The primary teeth have other important roles in the developing mouth and jaws: They serve as guides for the proper eruption (emergence above the gum line) of the permanent (adult) teeth. Each baby tooth holds a space for the permanent tooth that will follow it, and it doesn’t “let go” until the permanent tooth is ready to come in. Together, these tiny “pearly whites” help maintain the proper spacing of all the teeth in the jaw. Removing a tooth, particularly in the back of the mouth, is like taking out a brick in an arch — the arch can collapse. If posterior (back) primary teeth are lost prematurely, other adjacent teeth will often drift into the empty spaces, greatly increasing the risk for a malocclusion (“mal” – bad; “occlusion” – bite) to occur. This means that the permanent teeth may come in improperly or possibly not at all, and your child could require orthodontic treatment to correct the problem. The premature loss of baby teeth could even make orthodontic treatment more prolonged and costly if it is necessary for other reasons. If a baby tooth cannot be saved and is lost prematurely, it’s usually possible for children to be fitted for an orthodontic appliance called a “space maintainer” to keep the permanent tooth’s place open. This usually takes the form of a metal band cemented on the adjacent tooth, which is soldered to a stiff wire loop that extends across the gap and rests against the tooth on the other side. These devices have some disadvantages as they: often don’t restore full function; require monitoring; can become dislodged or break; may be cosmetically unappealing. Also, extraction and fabrication of a space maintainer may be more costly than saving the tooth. When possible, saving a badly decayed baby tooth rather than losing it prematurely is often a better alternative. If the decay reaches and/or infects the pulp (the living tissue inside the tooth), it will need to be disinfected and sealed. This procedure is known as a pulpotomy, which is much less invasive and expensive than root canal treatment for adults. 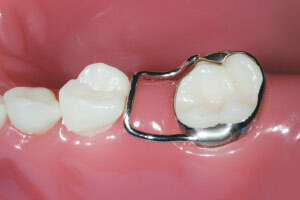 A dental “crown” or “cap” made of stainless steel (although many white crown alternatives are becoming available) is often placed over the tooth to restore its shape and function, especially when much of it has been destroyed by the decay. Ask your general dentist, or a pediatric dentist (a specialist in growth and development, and the diagnosis and treatment of children’s and adolescents’ dental issues), for more information. Once your 6-year-old’s tooth has been treated in this way, it should last until it is ready to be lost naturally. This will give your child the best chance for comfortable eating and speaking now, and proper bite development later.